Execution in stainless steel. Positive driving system to ensure a smooth and regular belt move. 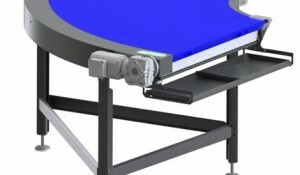 Largebends are fitted with a double deck system practicle to remove the belt from the top without dismantling the internal supports (ideal for suspended or superposed units), thanks to removable stainless steel top plates and end rollers.